Need a plan for the Easter holidays?! Don’t worry, Deep Sea World has you covered! Come and enjoy your days off by splashing about and discovering the wonders of our oceans. From shark diving, to coming face-to-fin with some of the most beautiful creatures in the world – there’s something fun for everyone! Oh, and guess what? Our Kids for a £quid offer means kids get in for £1! You heard us right: for every adult ticket that you buy, one kid can dive in for just a quid. What are you waiting for?! Grab those bargain tickets now and let’s go discover the ocean. The Kids for a £quid offer will be running from 22nd-25th March and tickets are redeemable between 30th March and 15th April – just in time for the Easter holidays. Aside from meeting the fascinating creatures that live beneath our waters, there are so many fun activities you can get involved with. Pop along to our daily talks and feeds to get a little closer to these aquatic enchantments. Stare into the eyes of a bearded dragon, meet our seals, and learn all there is to know about the underwater world. How brave are you feeling this Easter? Brave enough to dive with sharks? We promise you’ll have a fintastic time counting how many teeth they have! It’s not just for the adults, either, there are junior shark encounters available so the little ones can have a (safely) jawsome time too! Mermaids Are On Their Way! Not only are we running Kids for a £quid – guess who you’ll be able to meet? REAL LIFE MERMAIDS! Our Mermaid Event is the perfect opportunity to meet the real life Ariel. They’ll be swimming up from the depths of the ocean for a few days over the holidays. You can come and meet them on the 3rd, 5th, 9th, 11th, and 13th of April – the perfect opportunity for a swimmingly good shellfie. 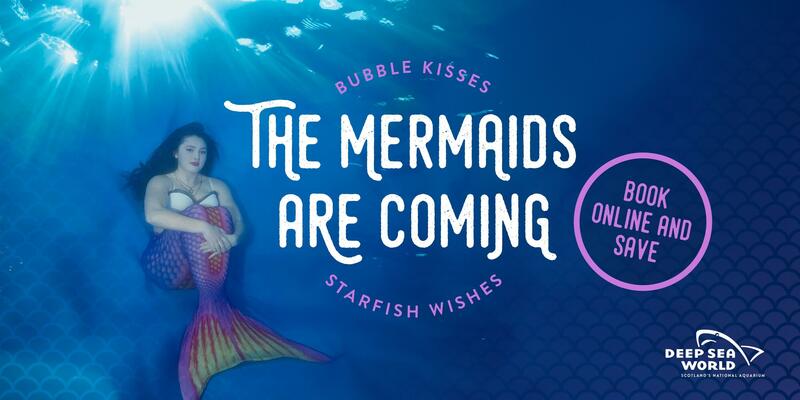 Be warned, tickets are likely to sell out quick and you definitely don’t want to miss the chance to meet our mermaid – we can’t even contain our excitement! They might be swimming by for a few more special dates – so give us a ring on the shellphone to make sure they’re here when you visit. Along with piranhas, you’ll have the chance to learn all about creatures such as: seahorses, lobsters, and red tail catfish. Go on, what you waiting for? Time to for you to meet our feature creatures. So how about diving on by this Easter? You can find directions and local information on our How to Find Us page. Make sure you let us know on Facebook or Twitter when you’re swimming by. We can’t wait to explore the ocean with you this Easter!